In the wake of an interstellar incident, a post-mortem dossier comprising interview transcripts, memos, instant-messaging transcripts, diary entries, and more is assembled in this mammoth series opener. Teenage colonists and exes Kady’s and Ezra’s lives are rocked by the 2575 assault on the Wallace/Ulyanov Consortium’s illegal mining colony by their corporate rival, BeiTech Industries. They are among the lucky ones who manage to evacuate—Kady to the science vessel Hypatia and Ezra to the United Terran Authority’s battlecarrier Alexander. The latter escorts both Hypatia and the freighter Copernicus in a monthslong race to safety while pursued by a BeiTech dreadnought, one likely to win should the ships engage again. Ezra’s recruited as a fighter pilot. Kady avoids conscription by flunking tests and highlighting her defiant personality, which allows her freedom to hack the ships. What she discovers disturbs her and leads her to communicate with Ezra again—both for more information and because of their unfinished business. 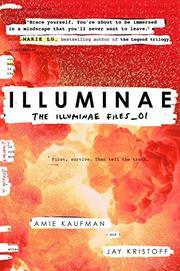 The two teenagers—a focus of the dossier due to their sleuthing—share and uncover disturbing information about an incident with Copernicus, the damage sustained by Alexander’s artificial intelligence system, and a terrifying virus. The design’s creative visuals take advantage of the nontraditional format, which gracefully juggles document types, foreshadowing, clues, voices, and characters. As the characters’ time runs out, the story ambushes readers with surprises. The account completes the incident’s history but not its fallout.